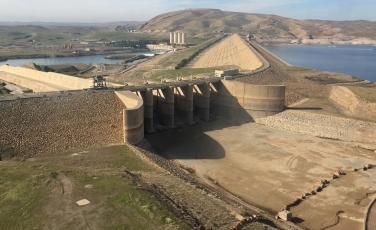 Trevi Spa have recently been contracted to work on the Mosul Dam, which is located in Iraq. Working as the main contractor, the aim of the project is to repair and maintain the discharge conducts and restore the floodgates, along with interventions of consolidation and waterproofing of the dam foundation through cement-based injection. The contract which is valued at €273m includes repairing the manufactured structures in correspondence to the bottom outlet and grout injections aimed at repairing the grout curtain. Trevi Spa will carry out works on the bottom outlet, which will be executed in the electromechanical parts, therefore requiring the intervention of divers and specialised sub-contractors. Furthermore, works for the maintenance of the grout curtain will include the installation of two rows of holes aligned with the dam, to be grouted with mixtures able to intercept and close fissures and voids deriving from dissolution phenomena. It will be necessary to execute and inject holes up to a depth of 200 m due to the stratigraphy and location of the soluble layers.